The word on the street within the Durango Area Association of Realtors was that the first quarter of 2017 "felt" busier. Statistics have proved that feeling correct. In town Durango homes were up 38% in number of sales over the 1st Quarter of 2016 with an 80% increase in total volume! In almost every category we saw an increase in the number of sales and a small to moderate variance in median price over 2016. In addition, most categories experienced a small decrease in days on the market. Land sales will be interesting to watch throughout the remainder of 2017. With the release of home sites in Twin Buttes, Spring Creek Village, Edgemont Highlands and others, we may see more buyers who cannot find suitable homes in or close to town, opting to build. The release of these home sites also provides opportunities for more spec homes, fueling our construction industry which in turn helps our overall economy. Interest rates, while higher than a year ago (30 year fixed rate averaged 3.58%) are still low with the 30 year average at 4.08%. Even within our country, real estate markets and trends are very localized. 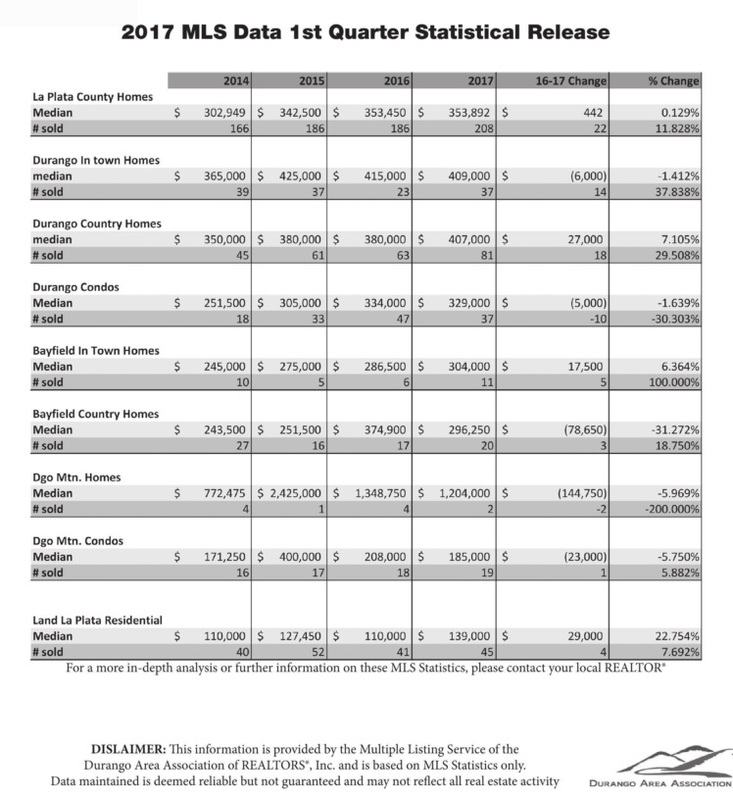 If you would like to view all of the Real Estate Statistics in LaPlata County, please click here.